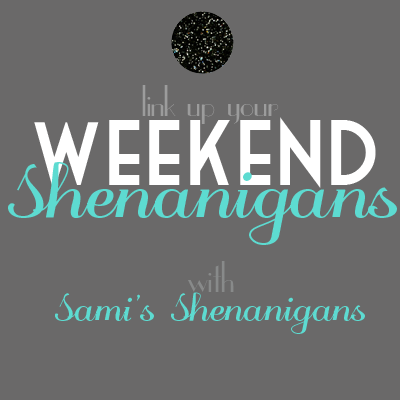 I thought I would link up for some Weekend Shenanigans again with Sami's Shenanigans in order to redeem myself for having such an uneventful weekend last week! Friday - Went out with some friends after work for dinner! We have all been SUPER busy, it was so nice to have the crew together again!!! Saturday - Hubby and I went to register for Baby Girl! WOW, this was MUCH harder than I thought it would be...took twice as long as our wedding registry, and we still aren't done! Babies sure do need a lot of stuff! At one point, I had FOUR high chairs on there! We had a really nice day though, had dinner at The Cheesecake Factory and I even had great success with maternity bathing suit shopping (you will read more on that in my next "bumpdate")! The best part is that after a long day shopping and registering, we went home and watched reviews of bouncers, and high chairs on Youtube! This is what our life has come to...love it though! 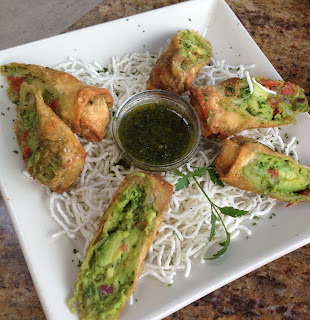 Avocado Egg Rolls as my MEAL....AMAZING! Sunday - Went out and about shopping, although I wanted to spend the day laying around....I'm glad I got out for a bit. Made a yummy dinner for hubs (Bolognese recipe coming soon). Then we watched Lincoln. Love Sunday movie nights. So it wasn't the most exciting weekend, but I sure have a lot more to report on this weekend than I did last! I am really sad we don't live in the same state because I know we would all be BFFs. Those egg rolls look amazing and I will definitely get those next time we go to Cheesecake Factory (our neighbor gave us a giftcard woo!) Happy Monday! Good luck with your testing window. OHmygosh, these look so good! They are building a Cheesecake Factory here (Knoxville's a little behind) and I will so be trying these when they open. I love food. Wish I loved to cook.